Gorgeous home in Pinehurst, North Carolina, the golf capital of the United States. 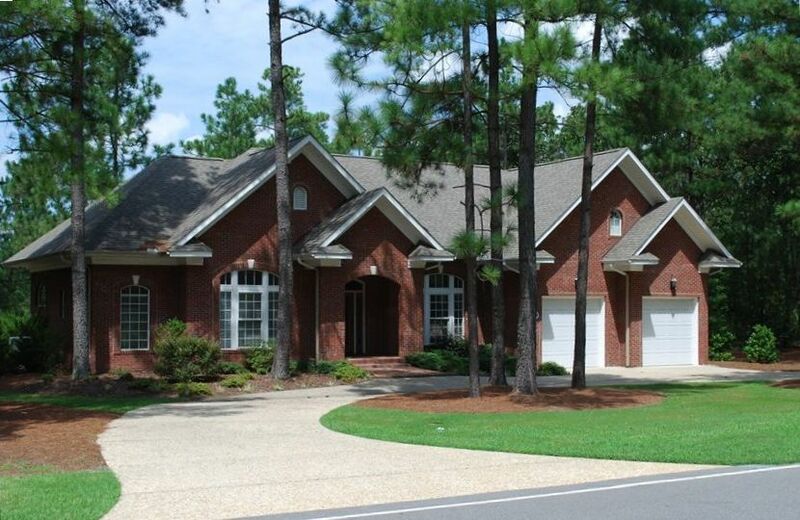 This 3,500+ square foot all-brick golf-front home with ten foot ceilings overlooks the 1st tee of Pinehurst Course No. 6. Spacious and elegantly decorated, this home has 4 bedrooms and 3.5 baths. All furnishings/beddings/linens/kitchen utensils and appliances are in excellent condition, were selected specifically for this house and were purchased new from reputable retailers/manufacturers, principally Crate & Barrel. The kitchen sports granite countertops. There is a wonderful brick patio, flat screen television in the living room, and cozy fireplace. Bedding arrangements are as follows: one king (ground floor master), three fulls (upstairs guest room) and four twins (in the two ground floor guest rooms). There are also two queen size fold out couches, two queen size self-inflating air mattresses and three chaise lounges. This home comfortably sleeps eight people (with one person per bed) and more if there are couples in your group or if you use the fold outs or air mattresses. We will provide golf assistance -- making tee times for you on local courses in advance (taking into account your preferences) and giving you the benefit of discounted greens fees. We cannot make tee times for you on the Pinehurst Resort courses. In the rec room you will find: (i) a Brunswick Highlander 8' pool table, (ii) a Canada Billiards 8' airhockey table, (iii) dart board, (iv) 5' flat screen with Wii and (v) massage table. The pool table has a ping pong attachment. A virtual tour is available upon request. Unobstructed view of the first tee of Pinehurst No. 6. High thread count sheets and comforters. 5 flat screen tvs with cable and blue ray or dvd, including 5' flat screen in rec room with Wii. Table on patio seats 6. To enter the front door, there are three small steps. There are several feet between each of the small steps. A person in a wheel chair will need assistance (but not much) navigating these steps. The upstairs bedroom (with the computer and three full size beds) is not handicap accessible. Iphone/Ipod/Itouch docking station with speakers. Pool table/commercial air hockey table/dart board/5' flat screen tv with Wii in recreation room. We thoroughly enjoyed staying at your house. Thank you. You could use an oven mitt (one is not enough to pull out a casserole from the oven), and some more dish towels (one isn’t enough). Appreciate it! Home was great to stay at, good communication, would recommend. Thank you so much for your kind review. We are so glad you enjoyed your stay with us. We are having a beautiful spring in Pinehurst. This home was absolutely perfect for the 8 golfers in our group from South Africa. We travel annually to an international golfing destination and this home in Pinehurst rates as one of the best we've had. Everything is as described, if not better. Stuart was very prompt in replying to our queries, and extremely helpful in planning and booking our golfing itinerary. Highly recommended. It was an honor to host your group. We really appreciate your positive feedback. We stayed here with a full extended family - grandparents, kids and grandchildren. The house has a great layout, great amenities and is well equipped. It was a great house for our family golf weekend and I would absolutely rent it again if coming back with a group of guys for a golf weekend. Highly recommend. Stuart -- thank you again for the wonderful accommodations at Pinehurst and for all of your assistance with the tee times. We had a group of four golfers and this was my second visit to your home. Everything was perfect! I really appreciate all the help you provided and would love to come back again. We had a wonderful two weeks. Stuart and the property management team were wonderful. We had sons playing during each week of the US Kids event and our eldest played on #6. Unbelievable walking a hundred yards to a world class practice facility and beautiful course. The next door neighbors were even great. Stuart took time from his vacation to set up tee times during our second week for our older son and friends that played week one while our youngest was participating in his event. The game room was a hit and a great way to wear off whatever competitive energy the boys had left at the end of the day. We would highly recommend Stuart's property to anyone looking for a golf getaway. What a great way to experience Pinehurst. We were so pleased to accommodate your group during the US Kids event, and we appreciate your kind words. We make every effort to keep this house maintained at the 5 star level. For instance, we paint some portion of the interior after every group leaves. We also have a professional manager and a crackerjack cleaning crew. We hope you come back again next year! Other Activities: Several spectactular golf courses are reachable in 15 minutes or less by car, including Pine Needles, frequent venue for the Ladies U.S. Open. Cleaning fees: $165 for stays of up to 3 nights, $250 for stays of 4 to 6 nights and $330 for stays of 7 nights or more.